Readers new to Roberto Calasso’s work often feel a bit bewildered, as if his books ought to come with a warning: This book is unlike any you’ve ever read. In addition to addressing the actual subject of the book, the reviewer must therefore explain who Calasso is, unpack his unorthodox rhetorical strategy, and provide some orientation to his uncommon perspective. This is easier said than done. 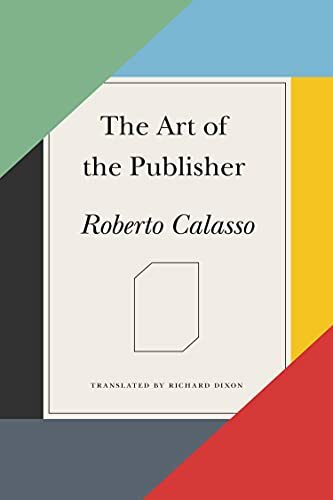 The Art of the Publisher, Calasso’s most recent work, consists of only 150 smallish and deceptively simple pages containing his speeches, essays, and occasional pieces about publishing. Briefly, he argues that publishing is an art, books are art objects, and the publisher is an artist. The publisher’s art has always been to provide the guiding sensibility for the publishing house and for the works it publishes. This sensibility is the mythos or spirit, if you will, of the publishing house. Today’s publishing houses lack this kind of vision and thus do not produce art. And the every-writer-and-reader-for-himself universe of electronic publishing cannot be art either, because it, too, lacks a guiding vision and the art object, books. There could scarcely be anyone more qualified than Calasso to make this case, and The Art of the Publisher offers entry into his fascinating world of leading edge literati. Intellectually, he is elegant and stylish in an Italian way: traditional, subtle, original. He writes from his formidable knowledge and from his experience as a founder and editorial director of Adelphi, an Italian publishing house of exceptional depth and quality with a backlist that includes the likes of Friedrich Nietzsche, Milan Kundera, Vladimir Nabokov, and Leonardo Sciascia. He considers publishing itself a literary genre. He writes erudite and highly original works on subjects few have considered, never mind named. He has an international following. While out walking you spy a coin on the sidewalk. You pick it up, intending to make a wish and throw it over your shoulder, a gesture that already connects you to a distant past. But, wait, it’s a gold coin with the image of a head crowned with a laurel wreath. And old. Did a coin collector accidentally drop it? You turn it over in your palm, recalling your own coin collection — the buffalo nickel, the pure silver dollars, the tiny pockets in the album. Did you know that the Smithsonian’s coin collection, the largest in the world, has more than 450,000 coins? Unfortunately, the exhibit closed years ago for lack of money. Upon closer inspection, you see that the image on the coin is likely Roman. The Romans minted coins from the 4th century BC at the temple of Juno Moneta, (the source of our word money), and they set up mints across the Empire, establishing minting practices for all time. Earlier still, Ploutos, the sometimes-blind Greek god of wealth, carried a cornucopia and dispensed riches. His near contemporary, a Phrygian named Midas, and the latter’s fairy-tale descendants had a different attitude toward wealth, one akin to the hedge fund manager’s. Along with coins and money came trade, banking, and the Medici, though the Romans had already invented checks, which are today dispatched on smartphones. Question: When you toss the coin over your shoulder, what do you toss? Answer: Civilization. A book by Calasso is always a journey into and through civilization in the company of an expert guide. …along with roulette and cocottes, founding a publishing house has always been one of the most effective ways for a young man of noble birth to fritter away his fortune. At this point, Calasso explores some questions in contemporary publishing the answers to which aren’t necessarily obvious. 1. Why does one become a publisher? …the choice and sequence of titles to be published; the texts that accompany the books; the way in which the books are presented as objects. In other words, the good publisher gives form to the “essential reading of his time.” This is very, very important to Calasso.
. . . give[s] form to a plurality of books as though they were the chapters of a single book. . . [and takes] . . . a passionate and obsessive care over the appearance of every volume. …a single text formed not just by the totality of books that have been published there, but also by all its other constituent elements, such as the front covers, cover flaps, publicity, and quantity of copies printed and sold, or the different editions in which the same text has been presented…[and this totality is]…a literary work in itself, belonging to a genre all its own. This vision is at the heart of Calasso’s argument. It is both secular and spiritual. The “single chain” that is “formed by all the books published by the publisher” is the unique work of art that the publisher brings to the literary table. It is both tangible — the books — and intangible — a reflection of the mythos or sensibility that is expressed in the “chain” and the “totality,” which “imply other related books not written.” For Calasso this totality is numinous. 2. Couldn’t these tangible and intangible connections exist without the publisher? There would still be good and bad books, but those good books would appear as sporadic, isolated events with no congenial context into which to fit them. There are very few people today who can be given the title of publisher. They could probably be counted on the fingers of two hands. Editors, on the other hand, are many and increasing, if editors are those who discover, follow, develop, and launch a certain number of books within the catalog of a publishing house. All editors are associated with a list of authors and books as though they are theirs. This, however, does not include the form itself — the catalog, the program of the publishing house for which they work. If a publishing house is not conceived as a form, as a self-sufficient composition held together by a high physiological compatibility between all of its constituent parts, it easily turns into a casual association, incapable of triggering that magical element — brand power — that even marketing experts consider essential for achieving some degree of success. Managers in today’s publishing houses often know little or nothing of books and care even less about form. Their mandate is profits. Calasso believes this organizational pattern precludes the publisher’s art. It is, in fact, anti-art. 3. But won’t information technology make all written works more widely available? A little web-surfing — mine — turns up dozens of niche sites for contemporary fiction, poetry, essays, and works of art — an argument in favor of art for art’s sake as the artists contribute their work gratis. Publishers’ websites — publicity arms, really, but presented as literary hubs — display varied imprints defined by consumer preferences. Other sites are more serious literary efforts that vanish when the editor gets a paying job. Barriers to entry are low, and some sites are scarcely more than hobbies. Often, sites are cross-listed, the better to achieve a higher ranking within the Google algorithms. The result is ever more self-referential and enclosed universes. A few sites, such as this one, grow and thrive because they serve real needs. In the face of…[immediate access to everything]…which grows wider and better every day, the publisher can only seem like a miserable obstacle. …if we limit the field to that of publishing, it can be said with certainty that there is one element that the cloud of knowing (or, more accurately, the cloud of information, though hasn’t the very distinction between information and knowledge become blurred?) can do without: judgment, that primeval capacity to say yes or no. But judgment was the basic founding element for the existence of the publisher…[who]…has always had the one undeniable prerogative: to say yes or no to a manuscript and decide in what form to present it. But if judgment can be easily dispensed with, this is even truer of form. Indeed, discussion about form could soon become meaningless. 4. Still, doesn’t the existence of literary sites, publishing houses driven by consumer preferences, as well as the self-publishing boom refute Calasso’s claim that only the good publisher can provide a meaningful place for literary output? In the digital universe everyone with a computer can be his own publisher, his own arbiter of taste, his own stylist of content, his own “decider,” but absent the publisher’s taste and judgment, there can be no art in Calasso’s sense of the word. Absent the “chain,” the “totality,” the publisher’s vision, there is no form, no mythos. Writers, readers, and books bob alone on a sea of dreck. 5. Why is someone like Calasso better at choosing what to bring to our attention than we are? Perhaps it’s not surprising that Calasso has been accused of elitism and paternalism. To be fair, however, his argument rests on more subtle grounds than simply that the good publisher is the necessary, singular arbiter of quality. Rather, he sees the publisher as having a responsibility to establish a vision and within that vision to practice his art. In this way, the publisher becomes the custodian and purveyor of what he believes is essential to his culture and time. “The gods are the fugitive guests of literature,” he says, meaning that the publisher’s mission, while secular, has a sacred element: the carrier or custodian of a mythos that guides and is reflected in the collective works he publishes. This “spirit” unites otherwise solitary authors, readers, and books. The sum of his acts as a publisher thus constitutes a form, which is, like sculpture or painting, art. Calasso ends by returning to the image of Manutius. He wants publishers to aspire to create new books that are equally as beautiful as Manutius’s perfect book. For some this charge may seem precious and as suffocating in its imposition of critical judgment as the Internet is in its lack of discrimination. This much is certain: No other publisher today has dared to claim as his own the singular judgment and unique artistry of the publisher-artist Calasso describes so precisely. That is because the one he has in mind is himself and the art his own. Rebecca J. Novelli is a writer, painter, and committed Italophile. Her novel, The Train to Orvieto, which is set in Italy, will be published by Black Heron Press in Fall, 2016. In it she explores cross-cultural marriage and family relationships, issues affecting women as artists, and the nature of truth. Roberto Calasso’s philosophical/mythological/literary investigations fascinate her. Death arrives in the first sentence of Ann Patchett’s sixth novel, State of Wonder. Deep in the farthest reaches of the Amazonian rainforest, a middle-aged drug researcher who was sent there on business but has no business being there succumbs to fever, and the secretive field scientists he’s with dash off a quick note to the States. It arrives “a breath of tissue so insubstantial that only the stamp seemed to anchor it to this world.” How terrible a weight these things still carry. Someone must tell his young family. Someone must pack up his office. And someone must be sent back up the river to recover his body and find out what the hell is going on. Patchett does not trade in weak women. (It’s the men, like Singh’s father, an Indian graduate student so absorbed in his studies that the family ate dinners on the floor, so as not to disturb his stacks of papers piled in the dining room, who are little more than shadows in Patchett’s work.) She subjects her women to terrible losses, and then lends them the strength to march forward in ways that are as heroic as they are practical. Singh is a winning narrator. Life has muddled her plans and substituted its own realities. An early marriage fizzled two years into her medical residency, so at thirty, she and her husband “bought their own divorce kit at an office supply store and amicably filled out the paperwork at the kitchen table.” A tragic accident at the hospital drove her from clinical medicine and sidelined her into a pharmacology PhD program. Having arrived, without intending to, alone at middle age, she might be permitted some bitterness. Instead, she wears her quiet self-composure like a charm, and if she suffers long nights of indecision about her mission to the Amazon, she doesn’t betray it. Feeling needed, she goes. Her boss and lover packs her off with a bundle of GPS technology and extra anti-malarials. He’s doesn’t want to stay in touch so much as he wants to keep her healthy and on a short digital leash. To borrow Wilde, to lose one employee is tragic—to lose two smacks of carelessness. Minnesota bookends the novel, but Patchett has written a Brazilian adventure tale. When she arrives, Singh’s passport is a “booklet filled with empty pages,” and she’s welcomed to the country by the disappearance of her luggage. Suddenly, luxury is a toothbrush and shopping in the market is an obstacle course of language and custom. By the time she leaves, months later, she’ll be wearing entirely new skin. Patchett captures well the essential loneliness and boredom of traveling solo; the foreign becomes exhausting, the heat devastating. Dr. Swenson stays in the field for months on end, and her gatekeepers in the port town where Singh is waiting are a pair of blithe young bohemians—house sitters who collect the doctor’s mail, smoke dope in her apartment, and stonewall inquisitive journalists. (“She was such a pretty girl. It must be hard, Marina imagined, for her to have no place to go.”) There is little to do but wait. As the pages pass, and the odd trio go on one field trip after another, we begin to forget why Singh has come in the first place. Then, like apparition, Dr. Swenson is back in town. Finally, we’re headed “down a river into the beating heart of nowhere,” the throttle on the boat—and on the novel—open full. History and art provide some useful examples of how things turn out when the white folks rush headlong into the wilderness, brimming with ambition and delusion, and Patchett slyly pays her dues. “Dr. Singh, I presume,” Marina is greeted when she arrives at the upriver research station. Fitzcarraldo, Werner Herzog’s 1982 film about dragging a steamship over a small Peruvian mountain, makes an appearance, as does Lost Horizon, the 1933 novel that invented Shangri-La. Dr. Swenson has been living among the remote Lakashi tribe for more than a decade, unlocking the secret to their astounding fertility, which allows women to bear children into their seventies. “Their eggs aren’t aging, do you get that?” an excited researcher asks Singh. “This is the ovum in perpetuity, menstruation everlasting.” Now there’s an idea that only a male drug exec could love. And though the stakes—and potential profit margins—couldn’t be higher, we don’t feel the tension build until the human dramas begin to play out at the station. Patchett has set herself an ambitious task. She begins far from home—Nashville, where she lives and writes—and moves steadily away from the known world. Her prose, as she established with Bel Canto and earlier works, is full of tenderness and insight; she writes of sorrow and invasive medical procedures with equal ease. Her language shows devotion to how the sentence unfurls across the page. She has remarkable skill, as a storyteller, knowing precisely when to cut away from a scene. She doesn’t write dialogue; she writes conversations, full of human surprise, humor, and outrage, which act in service to the many Big Ideas she’s probing—about aging and fertility, children and careers, ethics and abuse. Heart of Darkness had a post-colonial mission, well ahead of its time, and Conrad was swinging for the fences. State of Wonder has some questions, none of them as urgent, but compelling still. The jungle hides its secrets until the very last, threatening to swallow Singh altogether. The story is still roaring at full-throttle as she heads down the river, back to beautiful, mundane civilization and Minnesota’s summer raspberries. But escape is never so easy, and after what she’s seen, we doubt very much that her fevered dreams will leave her soon. Daum can relinquish that particular nightmare. The Unspeakable is a grown-up book that grapples with grown-up subjects: death, grief, regret, and aging. Press materials call it a report from “early middle age,” an expression that I have to believe made Daum laugh. By any actuarial or cultural measure, Daum is firmly in middle age: she’s in her 40s, she’s authored books, bought a house, gotten married, buried her mother, and been hospitalized for a major illness. I know all these things because she writes about them in her essays which, taken together, hit me more like a memoir. There’s a unity and depth to The Unspeakable that gives it more weight than My Misspent Youth. “Not What It Used To Be” can be read as a sequel to “My Misspent Youth,” the essay that leant its title to Daum’s debut collection and possibly made her career. Published in The New Yorker in 1999, “My Misspent Youth,” is Daum’s goodbye letter to New York City and to her youth, a city and state of mind she can no longer afford to live in. It’s reminiscent of Joan Didion’s much-imitated “Goodbye To All That,” in which Didion describes what it feels like to fall out of love with New York City. Daum dispenses with Didion’s vague melancholy and gets down to facts and figures, sharing rent bills and Visa debts, letting us in on a truth that thousands of New York’s aspiring writers have since had to face: it is impossible to live in Manhattan (and now Brooklyn) on a freelancer’s salary. To read “My Misspent Youth” now is to see, not only the glimmer of Michael Bloomberg’s Manhattan, but also a certain kind wistful-yet-gritty confessional writing taking shape, the kind of personal essay that prizes self-awareness, but is also defiantly self-indulgent. It’s the kind of essay that will go a little long and will get a little niche, because it can, thanks to the variety and flexibility of literary outlets on the Internet. I am nostalgic for my twenties (most of them, anyway; twenty and twenty-one were squandered at college; twenty-four was kind of a wash, too) but I can tell you for sure that they weren’t as great as I now crack them up to be. I was always broke, I was often lonely, and I had some really terrible clothes. But my life was shiny and unblemished. Everything was ahead of me…I found my twenties to be a time of continual surprise. As wary as I’ve always been of our culture’s rote idealization — even obsessive sanctification — of the bond between parent and child, it seems that I fell for a whole other kind of myth. I fell for the myth of the village. I fell for the idea that nurture from a loving adoptive community could triumph over the abuses of horrible parent. The sneaky power of cultural myths is a persistent theme in Daum’s work. In the preface to My Misspent Youth, Daum says her essays are about “the romantic notions that screw up real life while we’re not looking.” This may be too pat a formulation, but you could say that The Unspeakable is about the way real life screws up romantic notions. That is, Daum has lived a lot in the 15 years since she published My Misspent Youth, and these essays manage to communicate a great deal of that lived experience. In its own understated, comic way, The Unspeakable is a very ambitious book, one that attempts to chart a personal evolution, while at the same time acknowledging that the idea of personal growth is at best absurd. “I am no wiser or evolved than I was before,” Daum writes at the end of The Unspeakable. She may not consider herself wiser, but her writing in these essays is finer than it has ever been. This piece is such a tonic to my sadness following Miss. Harper Lee’s death and the whole “Watchman” debacle. A literary desecration in my opinion. To move from the world of books to the world of film, there was a very subtle dramatization of some of these points in 2013’s “The Reluctant Fundamentalist.” The setting is Istanbul. Changez Kahn, an ambitious young New York financial analyst originally from Pakistan, accompanies his boss and mentor on a trip there to put a “value” on a Turkish publishing company for possible acquisition. There is a mythic quality, as Khan’s two “fathers” (the New York financier and the cultured Turkish editor from the company) square off, with the very soul of their spiritual son in the balance. My favorite scene was a quiet lunch between Changez Khan and the editor (played by Haluk Bilginer). Khan’s father is a Pakistani poet the editor knows well. The editor is quiet but pointed, as he questions the very nature of the “value,” and whether such a man as Khan’s boss is even capable of measuring the worth of his beloved firm in any meaningful way. Thanks for calling my attention to “The Reluctant Fundamentalist,” which I had mistakenly conflated with a book about a young man faced with a decision about whether to join the Taliban. I hadn’t driven that mile myself yet, but I guess the NYRB is also pretty irrelevant if you’re a refugee or lost in the Amazon or just calling your ISP. The author is not his narrator. Still, it seems worth mentioning that Jackson is among the fine minds published by Farrar, Straus and Giroux, a publisher whose distinguished authors have long had bylines in the NYRB. Furthermore, Straus himself was one of the very few publishers Calasso considered an equal. @RebeccaJNovelli – Highly recommend “Fundamentalist.” Mira Nair did an amazing directing job. Loved the novel as well. When I think about the New Normal of publishing, I imagine the grim specter of “crowdsourcing” manuscripts (already a reality for some genre romance novels).This makes me laugh and shiver at the same time. One of the original 23 was the POV of a squirrel. I could not stop thinking about the squirrel. A poor furry creature, with a crooked and balding tail, unprepossessing , but blessed with the heart of a true romantic and an eye for the foibles of man. What if the cruel Groupthink of the crowd stifled his little chattering voice? Sigh. God knows what the crowdsource would have made of James Joyce! Crowdsourcing a novel isn’t a new idea, but I wasn’t aware that it had become so prevalent. The original may have been this one: “Naked Came the Stranger.” Very funny. Thank you for this thoughtful and well-written review of the book and for your evenhanded treatment of Calasso’s “elitism.” It made me rush to my shelf to pick up Cadmus and Harmony to remind myself how rich and discursive and erudite and mysterious and gorgeous his writing is. If this is elitism and paternalism, then my heart belongs to daddy. Your analogy for what it’s like to read him is spot on — you fall down the rabbit hole, kicking yourself for not knowing Greek or Hindu mythology or 6-7 possibly dead languages. But no time for regrets! Calasso is burrowing ever deeper into the ether — you are submerged and flying at once. Way over my head, so often, but so worth the disruption of regular programming. I will be looking for this new book — really enjoyed this piece. @Moe Murph — truly depressing thought — crowdsourced writing. The squirrel example is perfect! And I, too, had overlooked The Reluctant Fundamentalist. Will be looking for it now. “Mysterious” is exactly the right word for that experience of following Calasso where he leads, and I think of opening a bottle of champagne for how my mind feels when the journey ends..
A critic once wrote of John Updike’s “seeming inability to write badly.” True enough: even when Updike’s prose is at its most trivial, its most self-satisfied, its most pornographic — and his critics will point out that it is often all of these things — it is always, from a technical standpoint, immaculate. Given how difficult writing is, and given how much Updike produced in a legendarily prolific career that spanned more than half a century, it’s worth pausing to consider the remarkable fact of Updike’s talent. In terms of constructing beautiful sentences, Updike had few peers. Not just in the years after World War II, or in the 20th century, but in literary history. At a time when writing is spoken of with tedious frequency as a “craft,” Updike, in his metronomic virtuosity, is uniquely deserving of the term. Updike was exquisitely preoccupied with his own literary digestive process, and his virtuosity in clocking and rendering the minutiae of daily life was undeniably unparalleled, but his lack of interest in the bigger postwar, postmodern, socio-technological picture marked him, in my mind, as a classic self-absorbed sixties-style narcissist. The Library of America has just released its two-volume edition of Updike’s Collected Stories (nicely edited by Christopher Carduff), and while I doubt it will do much to improve the author’s sagging stock, at nearly 2,000 pages, comprising 186 stories published between 1953 and 2009, it offers ample opportunity for pondering Wood’s question, and the larger problem of John Updike: he was incapable of writing badly, but was he capable of writing, for lack of a better word, importantly? Having read nearly 200 of Updike’s stories in rapid succession, I’m more sympathetic to the critics’ point of view than I had been. While not willing to go as far as Franzen, who argues that Updike was “wasting” his “tremendous, Nabokov-level talent,” I was surprised by how many of Updike’s stories impressed me while I read them, and how few left an impression. One can open the Collected Stories to almost any page and find a surprising metaphor, a lovely description, or a wry morsel of irony without remembering much of anything about story that contains it. The stories that I’d already read and admired, the ones widely regarded as Updike’s best — “Pigeon Feathers,” “A Sense of Shelter,” “In Football Season,” “The Persistence of Desire,” “The Happiest I’ve Been,” and, of course, “A&P,” for decades a stalwart of high school curricula — now strike me as a largely comprehensive list, in little need of emendation in light of Updike’s larger corpus. The curious paradox of Updike is that he made art into a craft, but only rarely did he transcend craft to achieve art. In a sense, then, the answer to Wood’s question is that beauty is not enough, at least not the beauty of finely tuned prose and vivid images that was Updike’s specialty. Art requires the wedding of aesthetics and morals, and the case might be made that the morals are more important; few people would call Dostoyevsky a beautiful writer, but even fewer would contest that he was a great artist. There were many reasons for my feeling so happy. We were on our way. I had seen a dawn…Ahead, a girl waited who, if I asked, would marry me, but first there was a vast trip: many hours and towns interceded between me and that encounter. There was the quality of the ten a.m. sunlight as it existed in the air ahead of the windshield, filtered by the thin overcast, blessing irresponsibility — you felt you could slice forever through such a cool pure element — and springing, by implying how high these hills had become, a widespreading pride: Pennsylvania, your state — as if you had made your life. For anyone who has been young in America — for anyone who has been young — this passage needs no explication. It is beautiful, and it is certainly enough. My Two Italies is a hybrid memoir, both a recollection of personal experience and growth and also a scholarly look at the long-standing divide between Italy’s north and south -- the north characterized by wealth and culture, and the south by poverty and crime. For Luzzi, the divide is personally felt.